With National Volunteer Week just a week away, a community-based social welfare organisation in New South Wales is seeking people to join its ranks to help those in need. Source: Open Support. Open Support, a non-profit organisation that provides a support services to vulnerable and disadvantaged clients, has a dedicated team of more than 200 volunteers. But it is looking for volunteers aged 18 and over to become drivers for its Country Care Link service. Country Care Link is a no-cost transport service for regional NSW families, couples and individuals who require vehicle transport when coming to Sydney for medical appointments and hospital stays. With demand increasing as more and more country people find themselves struggling to meet the costs of travelling to Sydney on top of their health care expenses, Country Care Link now needs additional volunteer drivers to join its team. Country Care Link volunteer drivers greet and collect clients on arrival into and/or departure from Sydney via rail, bus or air, seven days a week. Current drivers include mums who drive during weekdays, retirees who are available throughout the week, and even executives who work fulltime but enjoy helping others by driving on weekends. “For many country people, coming to ‘the big smoke’ as they often call it, for health care reasons, is very daunting and they are very relieved to know that they will be met by one of our reliable volunteer drivers," adds Sr Jan. 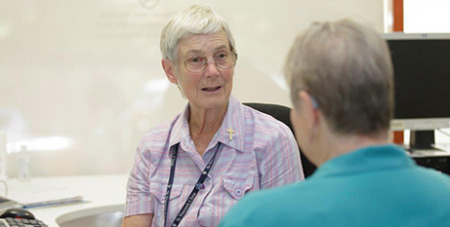 Since the service began in 1992, Country Care Link volunteers have provided thousands of trips for rural people attending health care services in Sydney. Passengers come from right across the state and range from young mums and dads requiring specialist medical care for their new-borns to elderly people needing treatment for ongoing medical issues.